Left to Right: Steve Rodriguez, The Outer Banks Hospital board chair; James Smith, Vidant Health police officer; Jolliff; Ronnie Sloan, president, The Outer Banks Hospital; Chuck Savage, Vidant Health police officer. 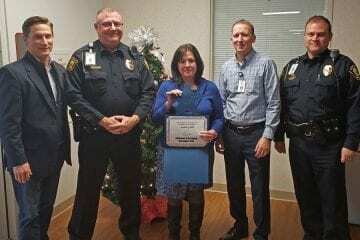 Switchboard operator Amber Jolliff is The Outer Banks Hospital’s December, 2018 Employee of the Month. Originally from Virginia Beach, Jolliff joined the Outer Banks Hospital in September of 2015 as part of the Environmental Services team and transferred to PBX in March of this year. Consistently going above and beyond in her role, Jolliff makes sure each caller is connected to the correct department or person. She has a full understanding of the importance of her position to the safety and security of the hospital. Joliff is often the first encounter a person has with the hospital and she makes sure to greet everyone with a pleasant and helpful attitude. She has an excellent work ethic and often volunteers to cover any staff shortages. She is truly a team player and works with her team members to accommodate schedule changes when they arise. Jolliff is loyal, dedicated, and is sure to always be punctual. She consistently exemplifies the core values of The Outer Banks Hospital.